Knowledge of metalworking gradually spread from Europe to Ireland during the 2nd millenium BC ( 2000 years Before Christ).The Bronze Age was called so after the metal Bronze which was a mixture of copper and tin. Copper was a soft metal which was easy to shape and mould and it was discovered that if a small amount of tin was added to copper that a much stronger metal was formed. This new metal was called Bronze. During the Bronze Age this new metal was used to make functional objects such as cooking pots, axes and shields. Gold was the preferred metal to make jewellery and decorative ornaments from. 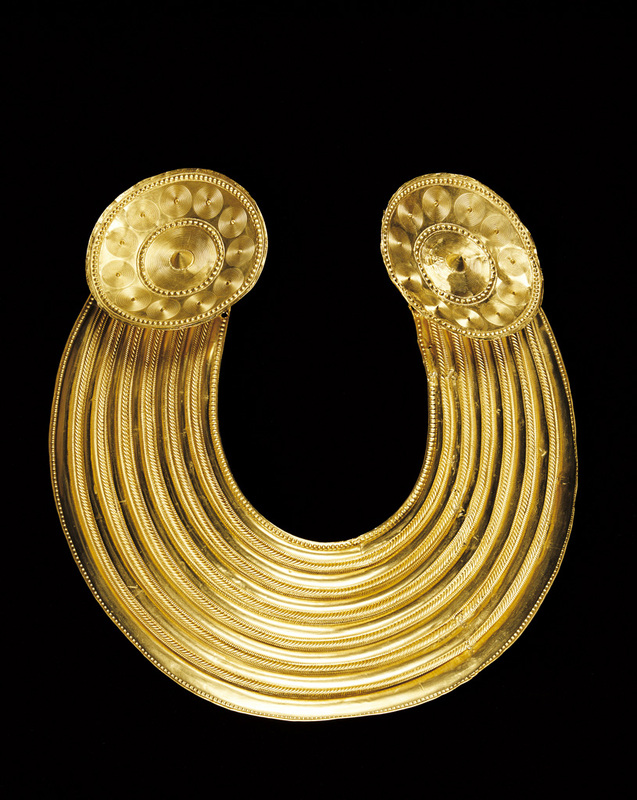 Unlike modern times, gold was commonly found in Ireland during the Bronze Age. 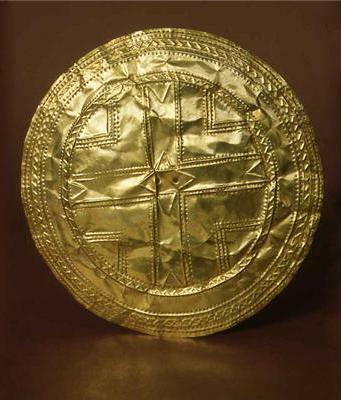 Gold Discs , also called sun Discs were among the very first metal objects made in Ireland. A piece of gold was hammered flat until it became a thin sheet – like gold foil. Then the circular disc shape was cut out using a sharp tool. The decoration was made using a technique called Repoussé. This was where the design was hammered in from behind so that it stood up in relief in the front. In the Gold Disc from teldavnet the cruciform design was hammered in from behind. The edges of the disc were decorated with concentric circles which were made using the repoussé technique. 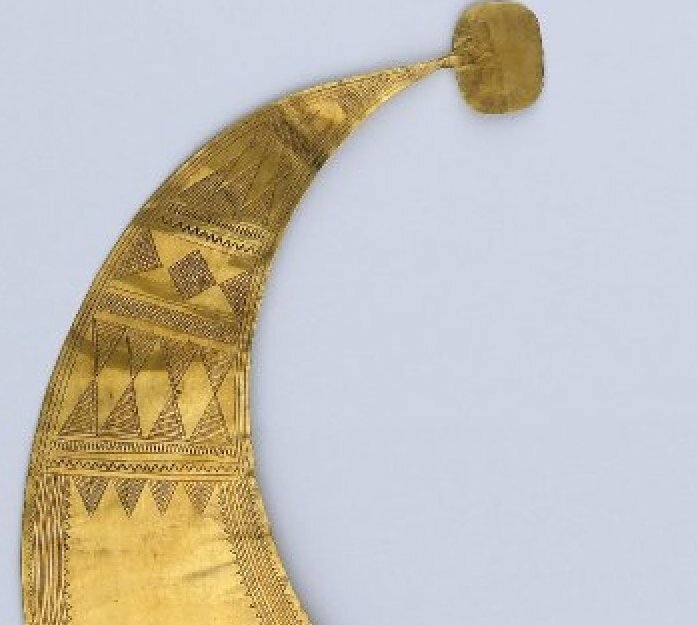 It is believed that these Gold Discs were worn – in the hair or attached to clothes. There are two holes in the centre of the discs ( like a button) where gold wire would have been threaded through to tie the discs to the clothes or the hair. Gold Disc, Teldavnet, Co Monaghan. In this Gold Disc you can see just how thin the gold has become from being hammered- its like gold foil. You can also see the two holes in the centre which were used to fasten the gold disc using gold wire. 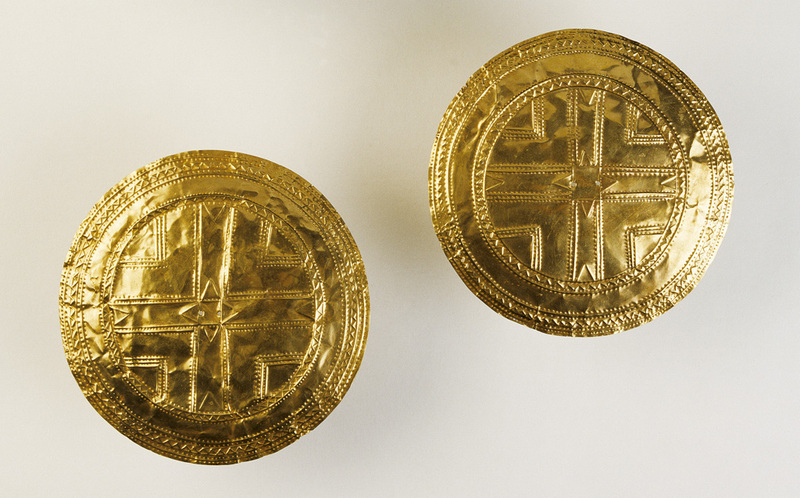 Pair of gold discs, Tedavnet, Co. Monaghan. Early Bronze Age, 2200 – 2000 bc. Lunula were worn around the neck. They are cresent shaped and are called after the cresent moon – lunula. They were made by hammering gold flat into a sheet and cutting out the cresent shape using a sharp tool. They were decorated with a technique called “Incision”- this involved cutting or incising into the surface using a sharp tool. Typically the designs that were incised into a Lunula were chevrons (zig- zags) and Lozenges ( diamond shapes). 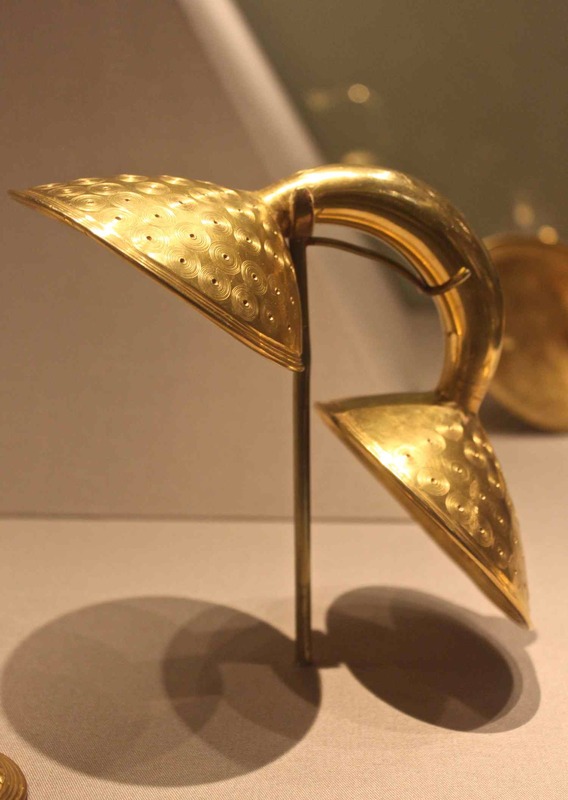 Lunula were among the first gold objects to be made in Ireland and they date to the Early Bronze Age. Chevrons and Lozenges incised into the Blessington Lunula. 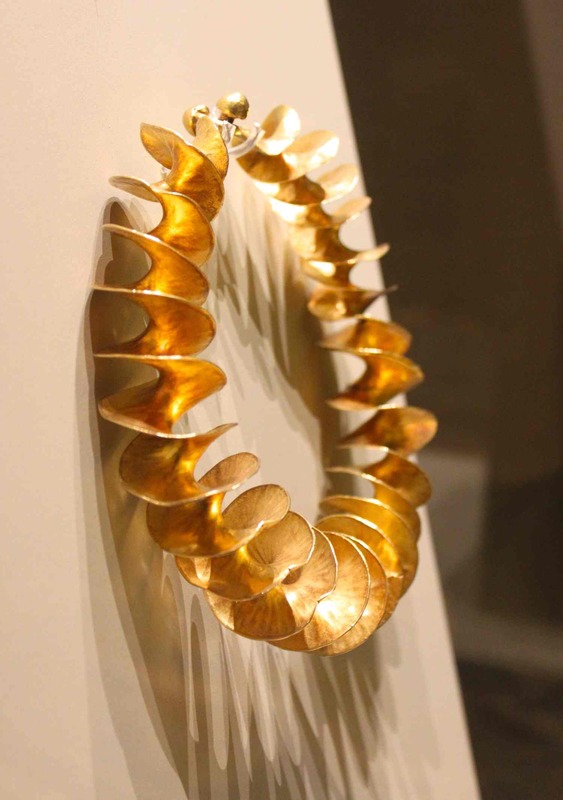 Torcs are twisted bands of gold which were made in various sizes to be worn around the neck, arms,around the waist like a belt or even small ones to be worn as earrings. Torcs date from the middle Bronze Age. 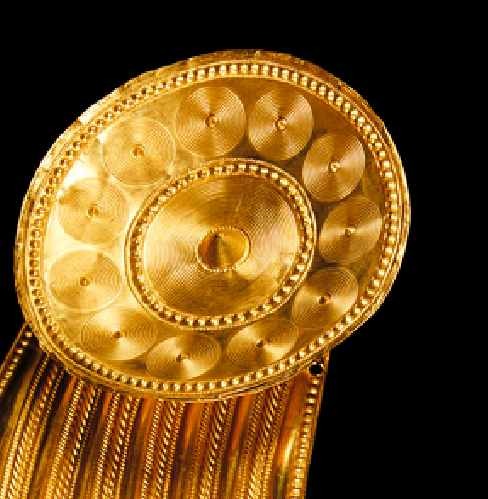 They use much more gold than the earlier Bronze Age objects such as the Gold Discs or Lunula and are a much heavier piece of jewellery. . A gold bar or band was twisted to form a rope like pattern. Often the gold bar was beaten thin at the edges to form a flange before being twisted. This is called flange twisting. It produces a much more delicate twisted edge than without flanging. 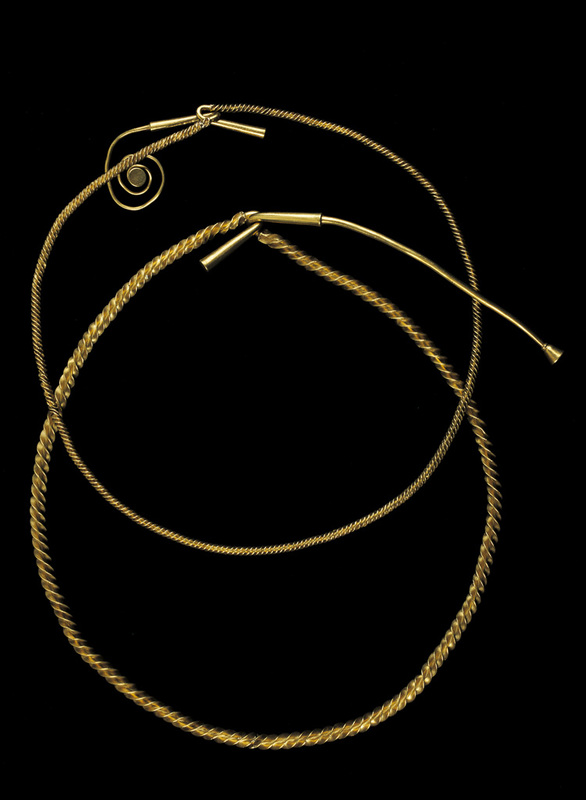 Gold Ribbon Torc . Found near Belfast. 3rd Century BC. National Museum of Ireland. 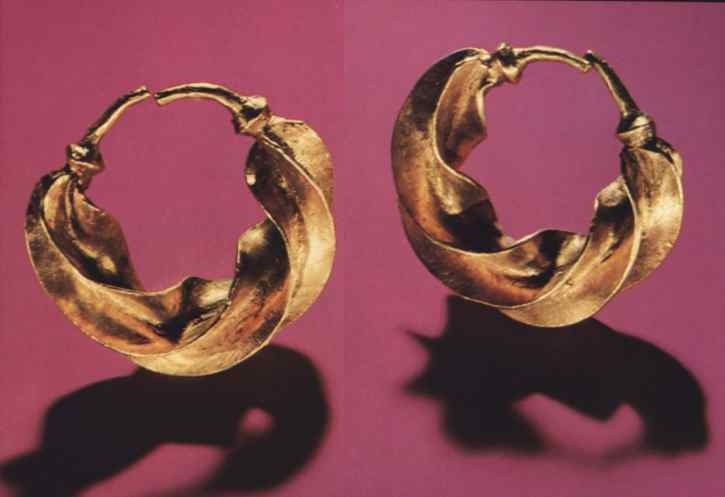 In this Torc you can see that the edges of the gold band were beaten very thin before being twisted. This produces a very delicate appearance like a ribbon giving the name Ribbon Torc . Photo by Reena Ahluwalia. Dress Fasteners of all sizes were made during the middle Bronze Age. This Fastener below is very large and heavy weighing over one kilo. It probably was used only for ceremonial purposes. It is decorated with engraved concentric circles. 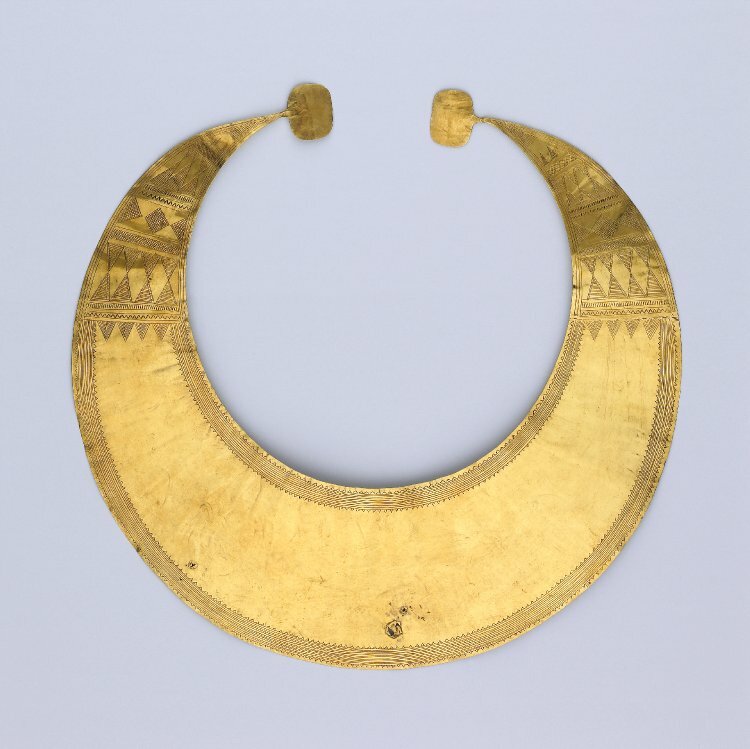 A Gorget is a type of gold collar to be worn around the neck. Gorgets were made during the Late Bronze Age and they display the range of artistry metalworking techniques that were developed during the Bronze Age. A Gorget is made in three sections. A collar and two Terminal Discs. The collar is decorated with rope pattern designs using the teacnique of Repoussé which involved hammering in the design from behind so that it stood out in relief. The terminal discs show a range of designs and techniques. In the centre a conical shaped boss stands out very prominently from the surface. Covering the surface of each disc is an elaborate design of rings of dots made in Repoussé and rings of incised concentric circles. Detail of Gorget. This is a close up view of one of the Terminal Discs. You can see in the very centre there is a large cone shaped Boss. Decorating the surface of the Terminal Disc are rings of raised dots made using the Repoussé technique and also rings of concentric circles which have been engraved into the surface. This article was written by Deirdre Morgan except where credited otherwise.